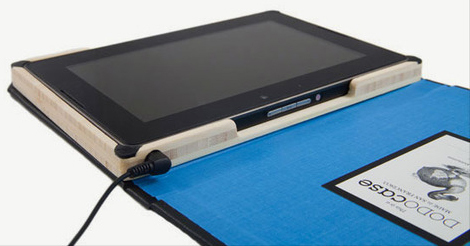 Dodocase, the makers of the widely popular moleskine cases for the iPad, iPad 2 and the Kindle using traditional book binding techniques have released a Dodocase for the BlackBerry PlayBook tablet. As a PlayBook user, you will be able to watch wide-screen movies and comfortably type using the Dodocase's stand and typing function. Too bad Dodocase didn't punch a hole for the back facing camera, but don't feel bad because iPad 2 users are in the same situation. $59.95 will get you one of these Dodocases which are available right now in 4 different colors.